Vinhos (Portuguese word for "wines") is a trading and economic game about wine making. Despite its small size, Portugal is one of the world’s leading wine producers. Over six years of harvests, cultivate your vines, choose the best varieties, hire the best oenologists, take part in trade fairs, and show your opponents you are the best winemaker in the game. 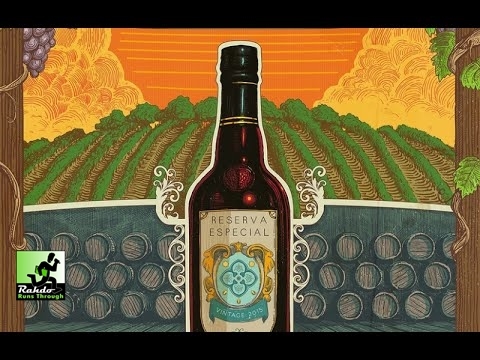 The players, winemakers in Portugal, will develop their vineyards and produce wine to achieve maximum profit. The object of the game is to produce quality wines that can be exchanged for money or victory points. Awake your senses and have fun making and selling your own wine. 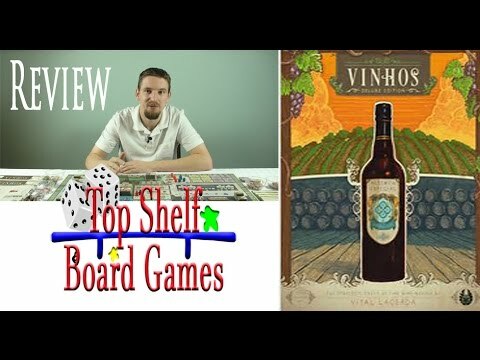 This new special box, with a completely new art from Ian O'Toole, comes with all components and improved rules of the original game of Vinhos, and a new simplified version of the game. The board is double-sided and brings both versions of the game. This box also brings some new additions as 30 new action and scoring tiles, a bigger number of cellars, wineries and enologists, a new region to play, the advertisers expansion, and also new expansion like Madeira Island, Special vineyards and wineries and a 5th property. It also brings new improved rules for both versions of the game.